It has been suggested that Paris-Sorbonne University Abu Dhabi be merged into this article. (Discuss) Proposed since January 2019. This article is about the successor of the faculty of humanities of the University of Paris, active from 1971 to 2017. 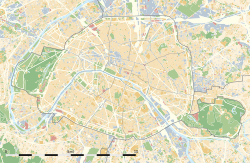 For its successor, see Sorbonne University. Paris-Sorbonne University (also known as Paris IV; French: Université Paris-Sorbonne, Paris IV) was a public research university in Paris, France, active from 1971 to 2017. It was the main inheritor of the Faculty of Humanities of the University of Paris. In 2018, it was merged with Pierre and Marie Curie University and some smaller entities to forming a new university called Sorbonne University. Paris-Sorbonne University was consistently ranked as France's as well as one of the world's most prominent ones in the humanities. QS World University Rankings ranked it 13th in humanities internationally in 2010, and 17th in 2011 and 2012. Times Higher Education World University Rankings also ranked it as France's highest reputed institution of higher education overall in 2012. Sorbonne in the Latin Quarter in Paris, France. Historical house of the former University of Paris, and main university building of its successor Paris-Sorbonne University 1971-2017. Paris-Sorbonne University was one of the inheritors of the Faculty of Humanities (French: Faculté des lettres) of the University of Paris (also known as the Sorbonne), which ceased to exist following student protests in May 1968. The Faculty of Humanities of was the main focus of the University of Paris, and subsequently Paris-Sorbonne University was one of its main successors. It was a member of the Sorbonne University Group. Paris-Sorbonne University enrolled about 24,000 students in 20 departments specialising in arts, humanities and languages, divided in 12 campuses throughout Paris. Seven of the campuses were situated in the historic Latin Quarter, including the historic Sorbonne university building, and three in the Marais, Malesherbes and Clignancourt respectively. In addition, the university also maintained one campus in Abu Dhabi, United Arab Emirates. Paris-Sorbonne University also comprised France's prestigious communication and journalism school, CELSA, located in the Parisian suburb of Neuilly-sur-Seine. Paris-Sorbonne University maintained about 400 international agreements. As a successor of the faculty of humanities of the University of Paris, it was a founding member the Sorbonne University group, an alliance with the successor of the faculty of law and economics and of the faculty of science of the University of Paris; Panthéon-Assas University and Pierre-and-Marie-Curie University. This group allowed Paris-Sorbonne University students to study several dual degrees in combinations. Two graduate certificates in law from Panthéon-Assas University (Sorbonne Law School) were accessible for all the student members of the Sorbonne University group. Paris-Sorbonne University merged with Pierre-and-Marie-Curie University into the Sorbonne University, effective from 1 January 2018. 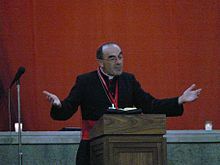 Philippe Barbarin (born 1950), French Catholic Archbishop of Lyon and cardinal. 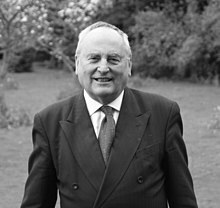 Donald Adamson (born 1939), British literary scholar, author and historian. ^ a b "Rapport d'évaluation de l'Université Paris-Sorbonne — Paris IV" (PDF). Agence d'évaluation de la recherche et de l'enseignement supérieur. November 2009. p. 7.